Aside from the irreversible damage to fragile reefs from reclamation and dredging, the Maldives stands to lose the unique Islandness (ޖަޒީރާވަންތަކަން) of an ancient ocean civilisation, writes environmental scientist Ibrahim Mohamed. “Pretending that we have to choose between the economy and the environment is as harmful as it is wrong” – Justin Trudeau, Canadian Prime Minister. 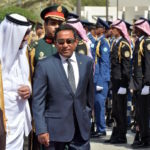 The news of the Saudi royal family’s desire to invest billions of dollars in a Special Economic Zone development project echoed loudly on local media recently. Many locals including several parliament members have raised concerns over losing sovereign rights of Faafu Atoll from this project. The Special Economic Zones Act allows foreign ownership of land for a period of 99 years and provisions on residency to foreign nationals within the SEZ. (b) Maldives government shall take necessary steps under relevant laws to grant SEZ residency for foreign nationals or companies who enter contracts to purchase or lease a right to use luxury villas bungalows condominiums and other residential properties inside zones and such residency shall be granted for the duration of the subsistence of that right. Projects of this nature not only have socio-economic and cultural impacts on local communities, but can also affect the coastal marine environment significantly. Hence, to further understand the environmental issues associated with such projects a brief understanding of geology of the Maldivian reef system is crucial. 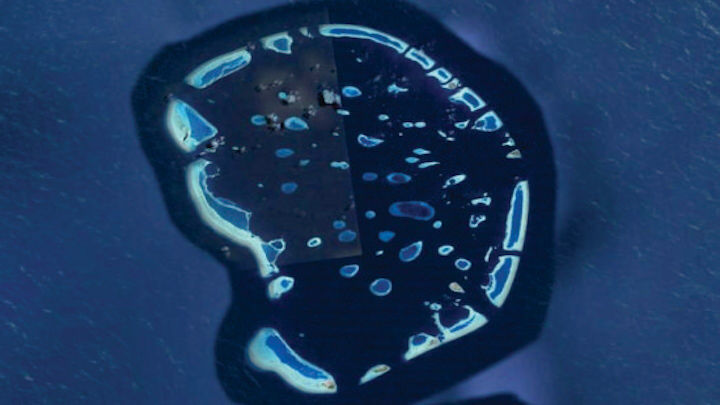 The Maldives is an atoll reef system formed on a volcanic basement. This volcanic basement originated from episodic magmatic eruptions from the Reunion Hot Spot in the Indian Ocean, while the Indian subcontinent was crossing over this Hot Spot several million years ago. Consequently, this volcanic basement formed into a mid-oceanic ridge setting (Chagos Lacadives Oceanic Ridge) composed of several mounds and cuts. Calcium rich limestone was deposited on the volcanic basement over millions of years. This limestone partially dissolved during the prehistoric sea-level changes when it was exposed to the atmosphere. These sequential changes known as karstification was crucial for coral reef development and growth, as coral larvae need to attach firmly on to the cavities and ridges formed by the dissolution of calcium carbonate. Over thousands of years, corals grew and eroded during the natural processes while the sequential sea level changes. This process led to the build-up of a two-kilometre deep carbonate bank on the Ridge. Since eight thousand years ago the sea level stabilised to the current levels and allowed coral reefs to flourish on this huge carbonate bank. This theory of atoll formation is called Karst Control Theory of Atoll formation and is considered one of the most established theories on the formation of the Maldives reef system (Belopolsky & Droxler, 2003). 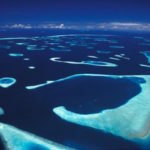 This reef system is the largest atoll reef system on a global scale. The coral reefs of the Maldives have undergone widespread damage since human habitation began 2000 years. Historian Naseema Mohamed believes that the first settlers built structures such as temples, stupas and tombstones entirely from corals. With the increase in life expectancy after the Second World War and subsequent improvements in the economy, islanders began building homes using corals and sand from beaches. The widespread coral and sand mining combined with poorly designed coastal modifications exacerbated erosion in almost all inhabited islands. According to the Second National Communication of the Maldives, one of the most critical vulnerabilities of the Maldivian islands is coastal erosion owing to heavy modification of shorelines and inundation from sea level rise, due to global climate change. Additionally, natural events such as swell waves have caused extensive land loss in several islands. Lack of proper scientific evidence and long-term studies make it impossible to determine the consequences of anthropogenic impacts resulting from dredging, reclamation and harbour developments. However, the topography of 90 percent of islands including resorts and inhabited islands is undergoing severe changes due to decades of coastal erosion. Even though it is hard to estimate the total loss of reefs due to modification of the shorelines, almost all the islands which have undergone reclamation and harbour development have experienced degradation of coral reefs to varying degrees. In the capital, all reefs are buried due to reclamation, while the development of artificial islands of Hulhumalé and Thilafushi resulted in the burial of large stretches of shallow reefs. The establishment of a billion dollar SEZ in Faafu Atoll of the Maldives will include large-scale land reclamation, dredging, port, airport and marina construction and hard engineered coastal protection. The atoll is not just the home to four thousand people but also to an array of coastal marine organisms from micro to mega fauna and flora. The construction of a huge metropolis in the fragile atoll will result in several irreversible impacts to reefs and other marine habitats. The most critical question for us is whether the physical geography and society and nature of the country is conducive for establishing SEZs common in countries with huge landmasses. The extinction of coral reefs due to climate change is considered to be one of the most daunting challenges for human civilisation. Thrush and Dayton (2002) has found that reclamation and dredging cause removal of critical habitats in the seabed along with seabed substratum, while reclamation results in the burial of entire ecosystems and habitats. In addition to the removal and burial of reefs the resulting plumes of sedimentation from mega-projects can smother and kill large stretches of corals within the vicinity of the projects (Smith et al., 2007). According to Sheppard et al. (2010) mega-reclamation projects in the Persian Gulf between 1990 and 2008 have resulted in the loss of huge areas of coral reefs and entire habitats critical for coastal marine flora and fauna. In another study, Zainal et al. (1993) found the industrial development of Fasht Al-Adham of Bahrain caused the loss of 22 hectares of reef and degradation of further eight hectares due to sedimentation. Chou (2006) found that Singapore has lost 60 percent of reefs due to coastal reclamation and dredging while degrading the remaining reefs along the entire coastline of Singapore. Many scientists argue that mitigating the damages to coral reefs from mega-projects is a formidable challenge and will result in the irreversible loss of entire reef systems. Hence, choosing economic development over the coastal marine environment is a dilemma for the Maldives, which relies on the healthy reefs for their survival and existence. Some 99 percent of the Maldives is beneath the sea and has become a tourism brand enjoyed by more than a million visitors every year. Another crucial question for us is whether we can afford to lose this brand, admired around the world for its unique Islandness. As a fragile country relying on coral reefs for physical, economic and social resilience, we need to establish Strategic Environmental Assessment and strengthening of the EIA processes. Additionally, enhancing public participation regarding major development projects is essential to preserve and protect the reefs of the Maldives. The level of public participation in mega projects such as the SEZ projects must involve public referendums and independent inquiry commissions to ensure environmental sustainability. 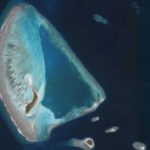 Damages from reclamation, coastal modifications and hard engineering structures have led to severe impacts on the coral reef system of the Maldives. “The shape taken by how we dwell on our islands, by the ways we have become socialised to understand and appreciate its sounds, sights, textures, flavours, and scents: by the ways our sensibilities differ from others [other civilisations and cultures], by the lessons and intuitions we have acquired in adapting to our islands: by our orientations to movement, rest, and how we encounter the speeds, and rhythms of our islands.” (Vannini & Taggart, 2013, p. 236). We are warriors of the seas and islands, and our blood is derived from the sea, lest we forget! Ibrahim Mohamed is a Ph.D. candidate at the James Cook University, Australia. His research focuses on the adaptive capacity of Maldivian islands to climate change. He previously worked as deputy director general at the Environmental Protection Authority.